I am sorry to hear that you feel Notary Cafe is not treating you in the manner you expected. I am a little confused about your statement that you have called and spoken with us numerous times. I personally deal with 95% of our customer service phone calls, and am unable to find any record of calls from you. Can you please give us a little more information about these phone calls? If you can tell me who you spoke to and the dates of these calls, I will be happy to investigate as to why your concerns were not addressed adequately Please email us at support@notarycafe.com with any details you can provide. Just to be clear - your Notary Cafe profile does not appear in the search results because you currently have a free, Basic Membership. Basic Member profiles are visible to our Signing Service partners, but not included in the general "Find A Notary" results. Pro Members have the option to be included in the public search if desired. We do not attempt to force anyone into a Paid Membership if they do not feel the advantages are worth it. We would prefer to keep our customers satisfied with the service they receive, both Basic and Pro Members. Again, please email us at support@notarycafe.com if you would like to continue this conversation via email. I will also be happy to call you personally to discuss the issues that you have alluded to here. 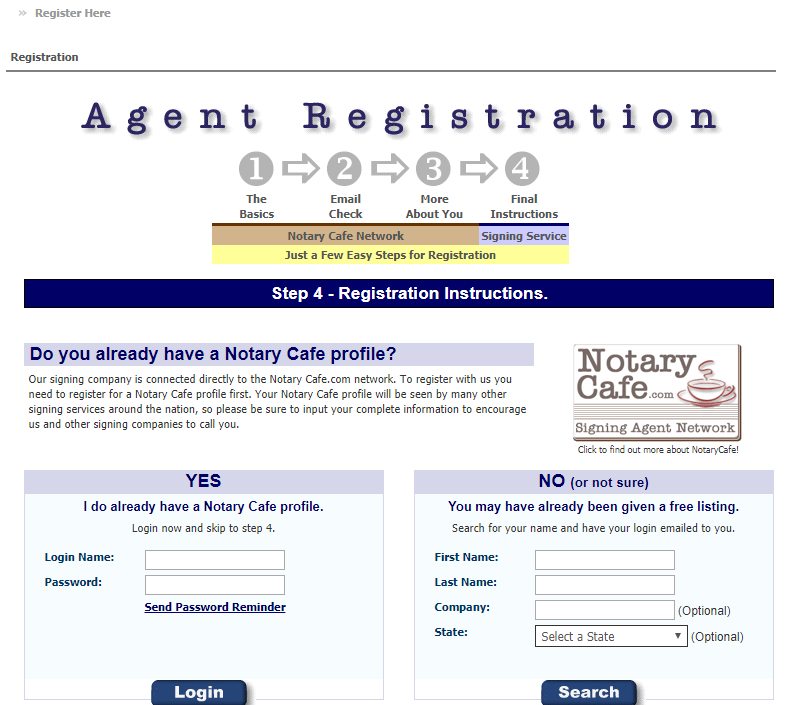 Notary Cafe is not a scam at all...never has been - in fact it's one of the top sites for listing your notary services. And it's just like real life - it's based on "you get what you pay for" - free listings give you limited exposure and options, paid listings give you more expanded exposure and options. And I will say that Notary Cafe's fee for this, should you choose the paid listing, is one of the lowest in the market. And their customer service, in my experience, is fantastic. I don't think I've ever received a signing from Notary Cafe, which is not to say I don't receive any value from being a member. I like the forum topics and responses, and somewhat frequently I have customers from other sources who check Notary Cafe to see if I am a member. Any expectations from Notary Cafe beyond this may be expecting too much. You may well have gotten assignments from companies that are linked to this database and you just don't realize it. To best utilize your marketing dollars, teach yourself to ask where a new client found you. They rarely volunteer the info - it isn't their focus. It's possible, possible I just don't realize it, in which case it doesn't matter. I wanted to follow this discussion up with a little more information as it does directly reflect on Notary Cafe, as well as my own specific role here. I have personally reached to the users who feel slighted by Notary Cafe here in an effort to resolve these issue. There seems to be some miscommunication, but I have been unable to gain any further details about the issue. Unfortunately, my request for information have not been returned. I have supplied some signing statistics for others and explained that we actually try to stay behind the scenes when possible, allowing the user to devote their time to the job at hand. Personally, I appreciate this approach - but do understand how Notary Cafe may be overlooked in the process of being assigned to a signing. This particular thread has been viewed quite a bit over the past few days, and I feel that it is only fair to let viewers know that we have not attempted to sweep these issues "under the rug", so to speak. Our goal is to help provide users a way to gain visibility in this fast paced, stressful industry. When issues arise, we try and deal with them how we would like to be treated ourselves if the situation were reversed. Thank you for taking the time to read this. Without you - we would not be able to continue doing what we do. Personally, I don't think it's a scam, however, I have had no known benefit from my prime membership last year. Most of my assignments come from Snapdocs and various other referrals. I do enjoy the blogs and that has value. Thank you for contributing to this discussion. I took the liberty of reviewing your account with us and found that in the previous 12 months, you have completed 42 signings in our system. While I understand that each one may not be a direct result of your former Pro Membership, I do suspect it at least played a role in helping your profile gain visibility in the network. I felt that this might be a good example of how our behind the scenes approach can get lost in the shuffle. I blocked out your personal information here - but please let me know if you would prefer this screenshot be removed from this post. If you would like more specific details, just let me know and I will be happy to share them with you! I'm a little confused. It states 42 signings completed in your system. And I also understand the visibility part. However, aside from the "number" I have not seen any direct connection to Notary Cafe and to the signings I've completed. Perhaps feedback on the various signing agencies that have found the notary on Notary Cafe which has ultimately led to a completed signing would be helpful. Thanks for your feedback! I too, wish the system allowed Basic Members an easy way to view the number of signings completed in the system. I believe that it would help in situations where our connection to the signing services is not easily recognizable. We do not supply individual feedback on specific signing services simply due to the fact that we are not involved in the actual signing. We do not see the contract between Notaries and Signing Services and we do not facilitate payments. When a disagreement does occur - we do not have any idea of who is "right" or "wrong." Experience has shown that errors occur on both sides of contracts. Without firsthand knowledge of the particular situation, I do not believe we should have a say in the outcome. That said, I will often point users to the forums here if they ask about a particular signing service. I also believe that the personal experiences of others outweigh our warnings or recommendations since we do not partake in the signing process in the same way that you as a Notary do. I have talked with quite a few Notaries who take the initiative of asking the signing service or title company how their contact information was obtained. Most report that the information is shared without hesitation, but we do not make it a requirement. It is bit of a "less is more" mentality - where we stay behind the scenes managing the profile and document data, but do not want to interfere with end result of getting the assignment completed. Again, we appreciate your feedback and will always take it under consideration. We know that there are areas where we can always improve and will try and do so whenever we can. So, key being, make sure your profile is as complete as possible because companies that use this database rely heavily on what they see in your profile. So how do you validate the qty of signings posted, in my case 42? There must be some type of feedback to notary cafe from a signing / title agency stating that the singing is complete. If that is the case, one should know who the signing / title agency is. This would be helpful. That's interesting as I have never had this pop up occur and I work for hundreds of signing / title agencies through out the country. The completed signings number is a direct result of a Signing Service using our system to mark a signing complete. It is an automated number that records these tallies and shows the appropriate number depending on the time frame in question (12 months or 3 months). It is managed completely by the system and there is not a manual way to change it. The reasoning for this is to ensure that the numbers are honest, and not inflated/deflated to manipulate the reputation of the Notary. To be honest, the completed assignments could be a little more robust than it currently is, but I always offer what I have available to anyone interested. Unfortunately, we do not have detailed records of completed assignments - only the number of them that have been marked complete in the system. It does not log the specific dates or times, but rather is intended as a quick overview. (I do have the number of signings completed over the lifetime of the account and how many each Signing Service marked "Complete," but this info is not available for the 12 and 3 month periods, only lifetime.) I will send you a private email with the Signing Services and completed jobs with whom you have worked with in our system. Thank you for bringing up the "Do you already have a Notary Cafe Profile?" question presented at the Signing Service website. It is indeed still active and shows up when a user clicks "Register" on the Signing Service site. This indicates that this particular company does utilize our system and Notary database. Thanks for your open, honest and quick replies. These days that's rare. If you can send me that info, that would be great. You can send it to notaryforyou@optonline.net. Would love to see it. I just received a signing yesterday thru Notary Café. I will admit that this info doesn't JUMP OUT at you on the Confirming Order (really isn't even mentioned), BUT when you need to access hiring party's site, the ID & PW needed to do so are the same ones from your registration with Notary Café. I also think that those companies who utilize this site also send you an e-mail OR include w/confirmation what your ID & PW are. That's how I know this site works.